READY TO WEAR VINTAGE - OUR ITEMS ARE PROFESSIONALLY CLEANED BY SPECIALISTS & READY TO WEAR WHEN THEY ARRIVE. WRAPPED SO THEY DO NOT WRINKLE...THIS IS UNLIKE ANY EXPERIENCE YOU HAVE HAD IN THE PAST BUYING VINTAGE CLOTHING. Fabric: Brown light weight linen / muslin type cotton fabric. 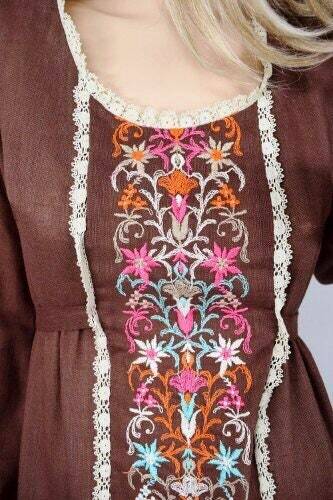 Colorful embroidery down the center panel with lace around it. Tons of details to make this brand stand out so much that I always buy their dresses when I can find them. Professionally cleaned by expensive vintage specialists. Cost $25 just to clean this garment.